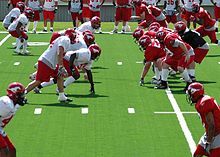 In American and Canadian football, a line of scrimmage is an imaginary transverse line (across the width of the football field) beyond which a team cannot cross until the next play has begun. Its location is based on the spot where the ball is placed after the end of the most recent play and following the assessment of any penalty yards. In American football, the set distance of the line of scrimmage between the offense and defense is 11 inches (28 cm), the length of the ball. In Canadian football, the set distance of the line of scrimmage is 1 yard (91 cm), almost three times as long as the American line. Many fans and commentators refer colloquially to the entire neutral zone as the "line of scrimmage," although this is technically not correct. In the NFL rulebook, only the defensive-side restraining line is officially considered a line of scrimmage. Referees, when explaining a penalty, will refer to "the previous spot" instead of the "line of scrimmage" in order to avoid confusion. Modern video techniques enable broadcasts of American football to display a visible line on the screen representing the line of scrimmage. The line is tapered according to camera angle and gets occluded by players and other objects as if the line were painted on the field. The line may represent the line of scrimmage or the minimum distance that the ball must be moved for the offensive team to achieve a first down. The line of scrimmage first came into use in 1880. Developed by Walter Camp (who introduced many innovations that are part of the modern game of American football), it replaced a contested scrimmage that had descended from the game's rugby roots. This uncontested line of scrimmage would set into motion many more rules that led to the formation of the modern form of American football. ^ Sportvision 1st & Ten graphics system.